After hearing some of my friends talk about Imanas and their delicious butterfish, I knew I had to make a stop in sometime soon. I used to frequent the place with my parents when I was much younger, but it's been about 10 years! So glad I went back though. The food is great- just wish the prices were less ridiculous! Beware, this is one of those restaurants that has a waiting list if you go at peak hours on peak days. Brian and I went around 830pm on a Saturday, and had to wait about 10-15 minutes. Not too bad! It will be less wait if you're okay with sitting on the communal table located in the middle of the restaurant. As for food, their Miso Butterfish and Seafood Dynamite are highly-rated, though I really enjoyed their Steamed Clams and Simple Salad. 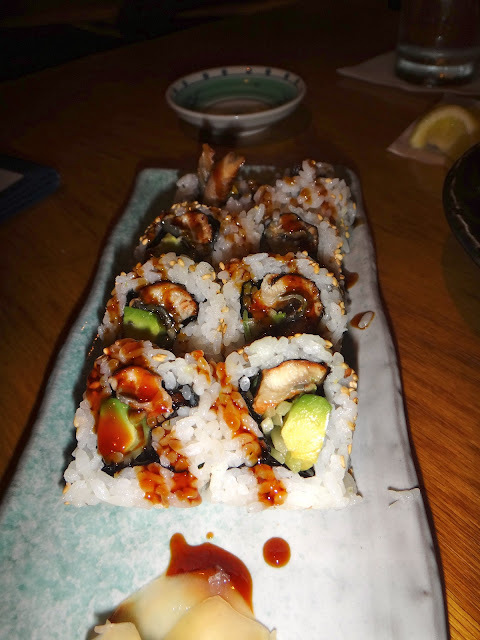 We also dined on their Unagi-Avocado Roll, which is ordinary, but just as delicious as everything else. Simple Salad- the dressing was so good!! Had to get an order of Ume-Shiso! Seafood Dynamite! Comes with big chunks of scallops, clams, shiitake mushrooms and Tobiko. Green Tea ice cream for dessert!